It's been so cold lately in Wisconsin I've been dreaming for spring to arrive! 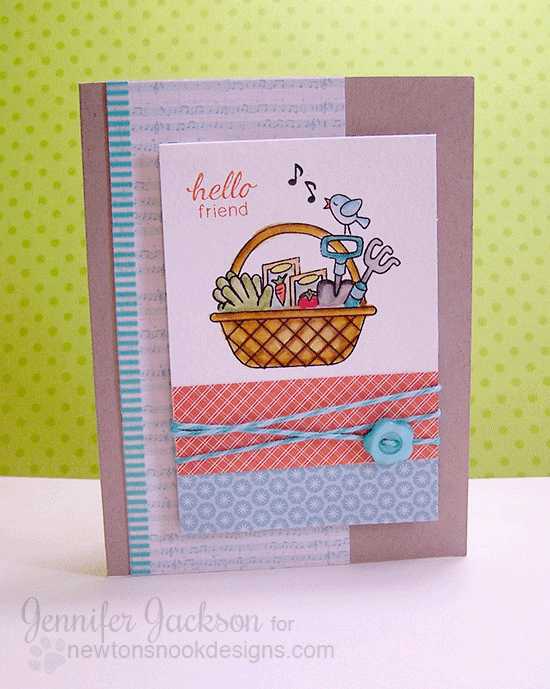 So today I'm sharing two fun spring cards using the Basket of Wishes stamp set. I thought this cute little card would be perfect to inspire everyone to "Think Spring!" 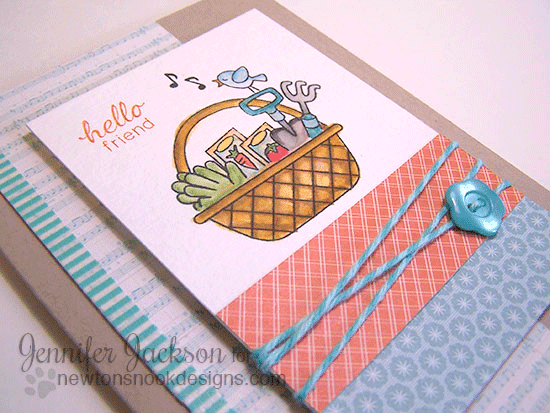 I stamped the basket and the top with the gardening tools using archival black ink on watercolor paper. I also added on the cute little birdie and the music notes in black. The I colored the whole thing with distress markers and a watercolor water brush. To finish out the card I added the "hello friend" sentiment in orange ink and added some patterned papers from my scraps along with some twine and a little flower button. The second card would be perfect for a spring wedding! I stamped the basket from the same Basket of Wishes set - but this time I used the top with the champagne glasses in it and I stamped it with Versamark ink on Vellum and embossed it with white embossing powder. I colored the basket on the backside of the image using copic markers. To make the card, I spritzed some gold ink on my card base and then added the image onto it with gold striped washi tape. I also added some gold and cream bakers twine. 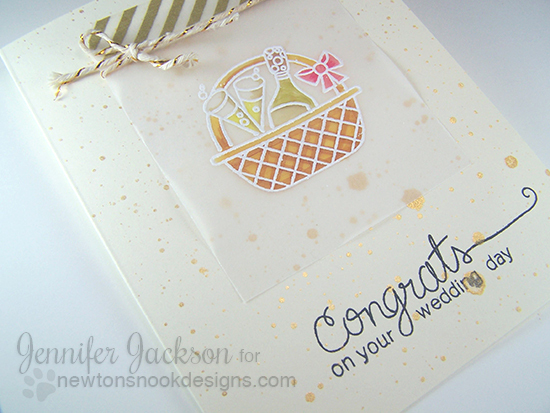 The sentiment "congrats on your wedding day" is made up using words from the Simply Sentimental stamp set. Keep thinking spring! I know it will be here very soon! 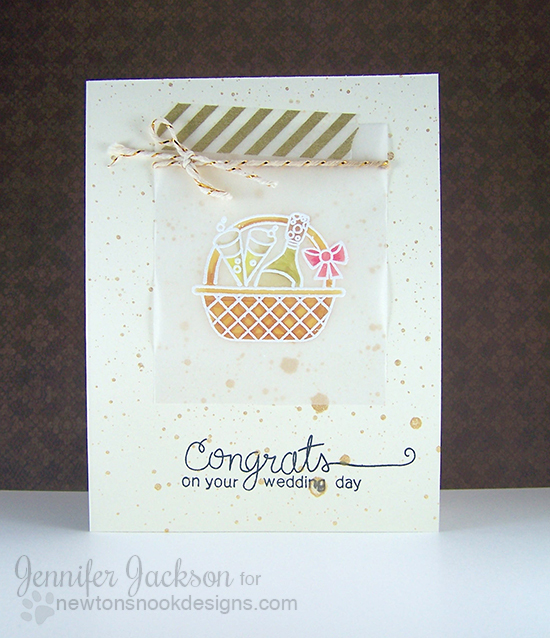 oh i LOVE the wedding basket card Jen! it is so beautifully done, and the coloring on vellum is awesome! Oh my, both these cards are sooo sweet!! The stamping on vellum is simply gorgeous. Both cards are so beautiful!! I absolutely LOVE the vellum layer of the second card, absolutely stunning! Adorable cards, that Copic coloring on vellum, turned out so pretty! I loVe your sweet cards. Thanks for sharing. I hope spring comes for you soon. We've had unusually dry weather for the last few weeks. It has been a little chilly but the sun peaks out here and there and that has been so nice. Hope the sun comes out for you soon.